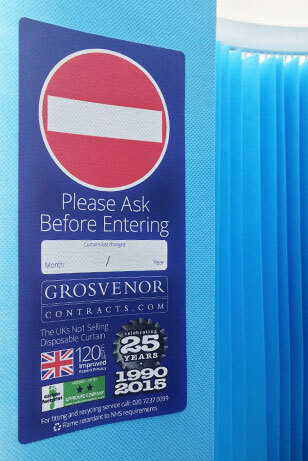 Grosvenor Contracts will be 25 years old this September and we thought we’d start the celebrations by refreshing the labels on our Disposable Cubicle Curtains. Traditional fabric curtains act as a breeding ground for harmful bacteria, need regular cleaning and also suffer from wear and tear. Available via NHS Supply Chain (supply only) or directly from us (supply & install or supply only) we are confident that our disposable cubicle curtains are not only superior in the fight against HAIs (Hospital Acquired Infections), but also offer best value for healthcare providers.